The stealing or commandeering of armored cars belonging to police or military forces, or even a bank armored car. The vehicles can be repainted, camouflaged, hidden in a garage etc. During the civil war in Yugoslavia, a Croatian grandmother named Rozika Militic (also spelled Rozsika Milicic), "the battling granny", along with her sons and grandsons, captured a Serbian tank, then sent a request to Croatian military headquarters in Karlovac for an operations manual. The Croats then turned the tank against the Serbs with Rozika commanding the tank, and her progeny driving and operating the weapons. 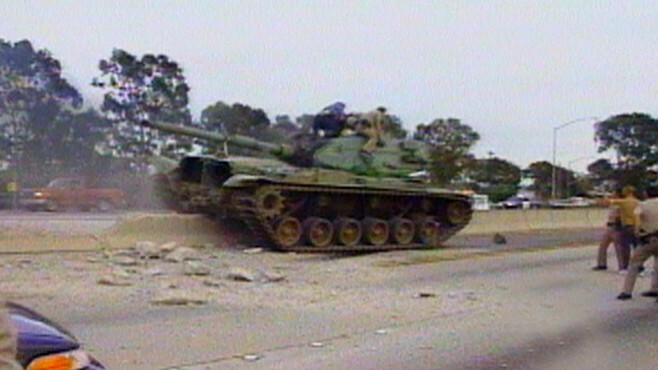 18 MAY 1995- A man goes on a rampage in a stolen M60 tank in San Diego, California. 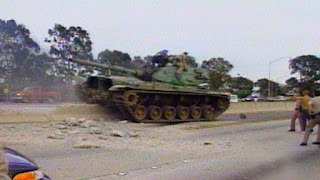 The tank was stolen from a National Guard armory. Police later managed to open the hatch and shoot the man to death. Outside of commandeering U.S. trucks, there are examples of Viet Cong sappers attempting to infiltrate american bases and commandeer U.S. helicopters as well. There are a few examples of the Provisional IRA stealing light civilian aircraft and using them to bomb enemy targets from the air or to rescue prisoners. Possible use of anchor chain to climb up enemy vessel. 06 SEP 2014- Renegade Pakistani officers and so called "Al Qaida" militants capture a Pakistani Navy frigate, the PNS Zulfiqar, and attempt to use the vessel to attack US Navy ships in the Arabian Sea. Pakistani Special Forces recapture the vessel and kill the militants.